I look at this cake and I long to make it while the vivid combination of the white and red in the picture amazes me a lot. 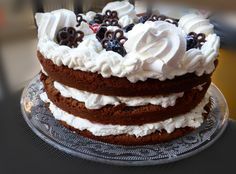 I read once more the ingredients, I count each one of my skills and the chances I have not only to manage the garnish with homemade creations but also to succeed in this sweet attempt. I think of the calories, the inappropriateness of the timing, and I stop. However, the irresistible desire to make something so different for my Greek taste and so beautifully impressive to my Greek eyes wins in me. 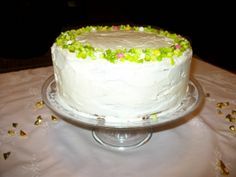 Let’s say, you also wish to make a cake…the same one that attracts me so much, a cake with cherries and cranberries! Mix and bake it, however you do not have to cut it, you can just admire it! Obviously, if one of your friends is tempted to taste, offer a slice or two, accompanied with homemade pomegranate liqueur or, a cup of green tea with the intense aroma of Chios mastic. Silver edible balls, cranberries and sugared green leaves for decoration, or improvise yourself! 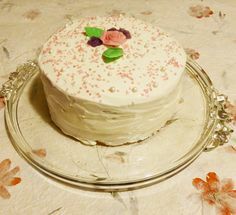 This cake recipe was published in the Sainsbury’s magazine, on December 2010 issue and I adapted it, altering a few things! Preheat the oven to 160 ⁰C, butter and sprinkle with flour an oblong shape of cake tin, 23 × 9 cm and then shake the excess flour. Put the cherries under warm water, rinse them and pat dry them with a towel. Cut them in half and together with the cranberries toss them with flour and leave them aside. Cut the marzipan in small cubes and mix them with the dried fruits. Shift together the flour and baking powder. Beat butter with sugar until it becomes a soft and fluffy mixture. Add gradually, in three doses the flour and the milk, starting and finishing with the flour. Add and mix gently the lemon zest, spices, salt and almond powder. 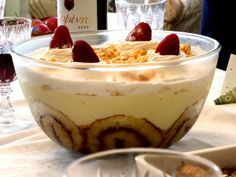 Continue with the dried fruits and marzipan, mix and finally incorporate the milk. If the batter is very runny add a little more flour or a teaspoon of milk if it is thick. It has to become a soft cake batter. Pour the mixture in the baking tin and use the back of a spoon to flatten the surface. Bake in the middle of the oven for 1 hour and 15 minutes. Do not open though the oven but only after ½ an hour of baking. Check if it is ready when a fork inserted in the cake comes out clean without any batter stuck on it. Take it out of the oven, leave it to cool for ½ hour as it is and turn it upside down to a rack, in order to gets completely cool. 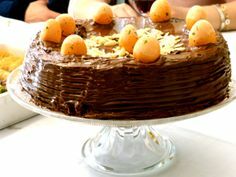 Put the icing on the cake: Spread a good amount of lukewarm apricot glaze on top, taking care that it does not run to the sides. Place a sheet of marzipan to cover the top of the cake. Spread again some glaze and put a sheet of sugar paste on top, half an inch wider than the edge of the cake to look like a roof! Decorate the top with silver sugar balls, cranberries and sugared leaves. Ideas: Preserve the cake in the fridge protected in a cake container. It is better to consume with the right fresh taste within the next 4 days. Pour cold water in a bowl and put the gelatin sheets to soak for 5 min. Dissolve the gelatin with a spoon in a saucepan on top of another one where water is simmering (bain marie). Add the butter, vanilla and glucose and mix well. Take it off the fire. In a mixing bowl where you have put the icing sugar make a whole in the middle with your hands. Pour into it the lukewarm mixture. Knead gently starting from the center to the edges in circles and shape the dough like a ball. On a clean surface put your soft dough and combine with the rest of the icing sugar. Fold and knead it, like when you are making a pie at least for 10 min. The dough will not stick at all and still be soft. Roll out the sugar paste to a thin sheet with the dough roller, which is slightly floured with corn flour. Now, it is ready to cut and cover your cake. First make the almond powder: Put 250 gr. of almonds in water and as soon as the boiling starts, take it off and peel the skin. 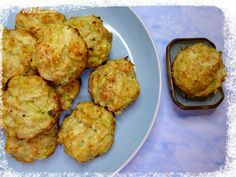 Put them in the blender in small amounts. Sift the icing sugar and mix the other sugar and almond powder. Add the lemon juice and the almond essence. 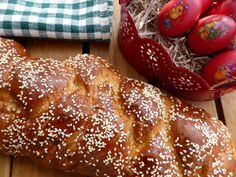 With a wooden spoon incorporate the beaten egg to form a soft dough. Work it with hands for a while. Turn it on a surface spread with corn flour or icing sugar and make a thick sheet, using the roller. From this quantity that can cover a cake of 22 cm, take the amount you need to cover the top of the cake and keep some for the small cubes into the cake. Simmer all the ingredients for 3-4 min. Sieve the mixture through a coarse sieve and simmer once more for 3-4 min. Use warm but not hot on the cake and store in the fridge the rest of the glaze in a clean and sterilized jar. Home-made pomegranate liqueur has a relaxed method of preparation, according to its maker! Besides, of course, this short advice “I pour the pomegranate seeds, sugar, cinnamon sticks, I secure the lid and I wait…”, it needs a large dose of vodka and a lot of sun kisses as it is brewed only under the hot sun! Good luck in this experiment! 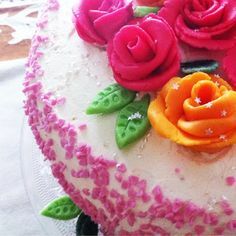 Ideas: If you will use home-made marzipan and sugar paste, keep the cake in the fridge from the first day of preparation. Place the home-made marzipan in the fridge before cutting the small cubes for the cake. Leave the remaining sugar paste in the fridge, wrapped in cling film for up to 1 week. Use it on top of small cupcakes, after you glaze them with the apricot glaze and decorate them with coloured sugar balls, again dipped in the apricot glaze so they can stick on top of the cupcakes.